Everything's bigger in New York, especially when it comes to the Ultimate Fighting Championship. When the UFC makes its return to Madison Square Garden in New York City this Saturday night for UFC 217, it will do so on the strength of three title fights. That’s become commonplace for when the UFC comes to NYC, a market the promotion was denied for years until the New York State legalized MMA a few years ago. When the UFC first came to NYC, last November at UFC 205, it wanted to make up for lost time, and it did so with three title fights, including Conor McGregor vs. Eddie Alvarez in the main event. The event was a blockbuster both on pay-per-view and in terms of the live gate, and the UFC wants another one of these big nights. 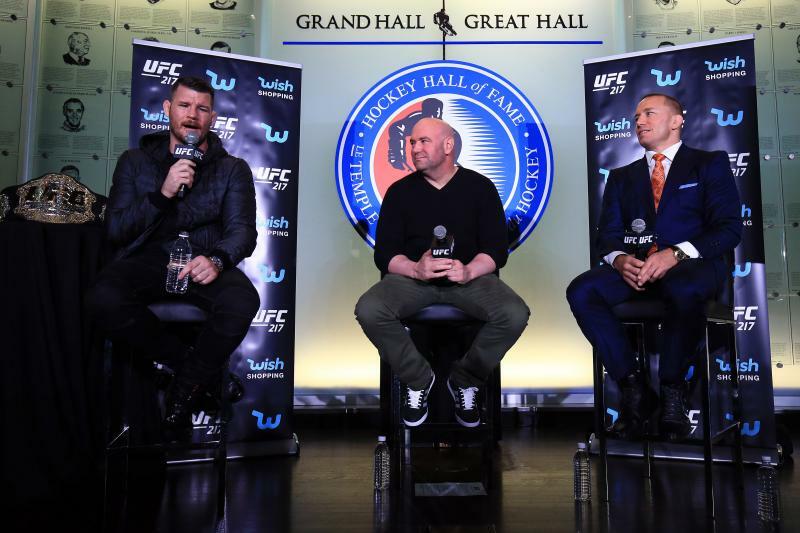 It’s clear the UFC sees NYC as a special market and when the promotion returns for UFC 217 this weekend, it will once again feature three title bouts. 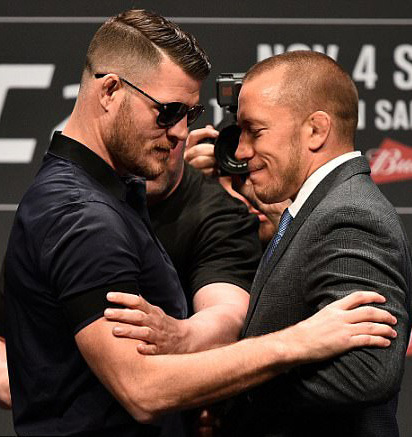 Although MMA fans in NYC won’t be treated to another McGregor fight, they will see the return of former PPV kingpin Georges St-Pierre, who fights UFC Middleweight Champion Michael Bisping in the main event. GSP, the longtime welterweight champion and one of the sport’s all-time greatest fighters, has not fought since UFC 167 in November 2013, when he won a controversial split decision over Johny Hendricks and then surprisingly retired from the sport. Much has changed in the four years GSP has been out, including his weight class (he’s moving up to 185) and the champion of the middleweight division, as Bisping shockingly defeated Luke Rockhold at UFC 199 to win the belt. Now, GSP will look to become the fourth fighter in UFC history -- after McGregor, BJ Penn, and Randy Couture -- to win belts in two different weight classes, though Bisping will be looking to nix that and further increase his record for the most wins in UFC history. Though GSP likely shouldn’t have gotten the middleweight title shot ahead of the division’s other top contenders, it’s clear the UFC sees this bout against Bisping as a big fight, and the organization has put all of its promotional muscle behind the fight. 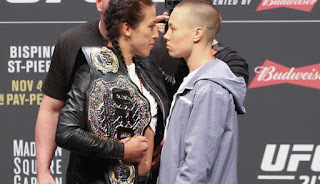 Not only has the UFC decided to put one of its biggest stars in the main event of UFC 217, but the supporting cast is also top-notch, as the card features two additional incredible title fights. 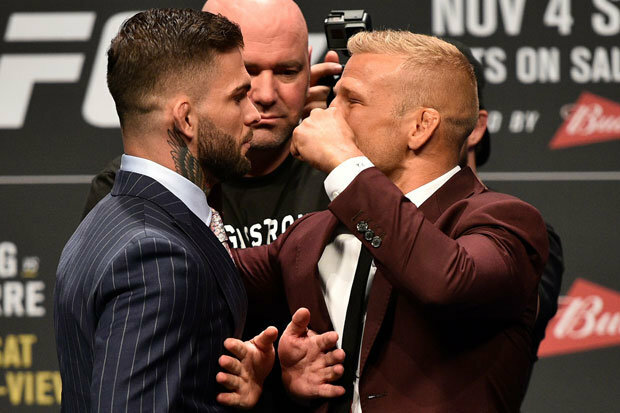 The co-main event is a bantamweight title bout between champion Cody Garbrandt and former champion TJ Dillashaw. These two used to be training partners at Team Alpha Male, when Garbrandt was just a prospect and Dillashaw was the bantamweight kingpin. But after Dillashaw left the camp with Duane Ludwig, he lost his belt to Dominick Cruz in a close fight, and Garbrandt later defeated Cruz in dominant fashion to win the belt and really get this rivalry between the former training partners brewing. Garbrandt and Dillashaw were supposed to fight in the summer but a back injury to Garbrandt pushed the fight back to UFC 217. But better late than never, as the addition of this matchup to this card just makes it that much of a bigger event. In addition, UFC Women’s Strawweight Champion Joanna Jedrzejczyk returns to take on challenger Rose Namajunas. Jedrzejczyk, the only champion the 115-pound division has ever known, beat up Karolina Kowalkiewicz at UFC 205 and will look to extend her win streak in NYC with a victory over Namajunas, who is one of the hottest fighters in the division. Of the three title fights on this card, this women’s strawweight bout has the longest odds in the champion’s favor, but all three of these title fights are intriguing matchups, and the UFC has done a great job putting these fights together and booking them for this megacard. Although the UFC could ideally spread its title fights around to various cards, sometimes the promotion just has to put together a blockbuster card, and UFC 217 in NYC is one of them. The promotion has made it clear that it values New York as one of the company’s biggest markets and is coming armed with three huge fights when it returns to The Big Apple this weekend. Fans can expect some terrific bouts, and UFC 217 will be one of the must-watch events for the fourth quarter of 2017. It’s sure going to be fun to see the chaos unfold.